I'm sure MSNBC would say it's just another one of those little unimportant and unintentional accidents that isn't worth worrying about, but exactly who do they think has committed an act of war here? 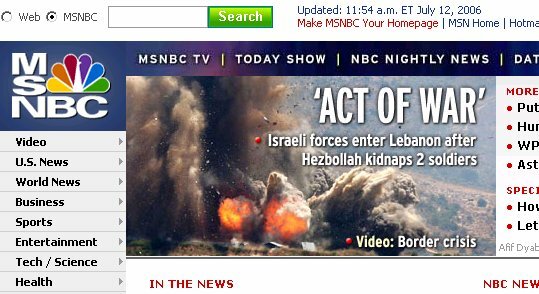 What fraction of MSNBC readers will scan this headline and come away with the opinion that this is all about another Israeli "act of war" in which it invaded Lebanon just because a couple more soldiers were kidnapped? How much louder will be the hue and cry against warmongering Israel as a result of this careless misimpression? How many such mistakes (like this for example) does the world media have to make before we cease calling it careless instead of the unintentional exposure of a world-view? I know, I'm oversensitive. I'll feel better after next week's UN condemnation of the Israeli invasion of Lebanon. // posted by AbbaGav @ 7/12/2006 07:04:00 PM | | | Permalink | EmailThis!